Every year, since I started to knit, I have made my own slippers. I knit, or crochet them and then I felt them. I have tried a couple of patterns, with some success. My first attempt at slippers, was a crochet pattern by Susie Johns. The pattern is called Mulan and was from Let's Knit Magazine, December 2008. I liked these slippers. In fact, I still have them. The only problem with these slippers is that they are knit with DK weight yarn and they are a little light weight for me. This is probably how they have survived since December 2008! 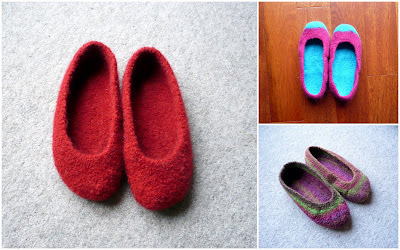 My next attempt at slippers was the Chilko pattern by Chrissie Day. This pattern was from another Let's Knit Magazine, this time from February 2009. I have given these details because people are always asking me where I got the pattern from, because they want to make these slippers. I have to admit, they are pretty damn fabulous! My favourites were the red ones, in the large picture. They are still being worn, but have a hole in the sole. The other ones have died and gone to that big slipper pile in the sky. Look at how they make my big plates of meat a teeny bit more elegant! I know it's a bit of a stretch to think of my huge feet at elegant, but I'll take any help I can get. The yarn I used, this time, was Cascade 220 and I LOVE this shade of purple (8886). I actually picked up 3 skeins of this, pretty cheaply, on eBay, but I know it is getting easier to obtain in the UK. I have bought some from Get Knitted before and I've seen it at First 4 Yarns. Both shops have a good range of the Cascade colours to choose from. This was the first time I had used this yarn for felting, but I will be doing so again. It felts beautifully, and the colours are gorgeous. I did, however, throw a couple of colour catchers into the washing machine, and they came out a very deep purple indeed, so I shall have to remember that for next time I felt with this yarn - it will run! If you know me, you will probably be aware that I don't like to do a felting wash with only one little pair of slippers in. So you won't be surprised to know that in the next couple of weeks you will be seeing more Finished Objects from this load. They will appear gradually, as I want to add fabric, and other such embellishments, to the other three projects. So until I finish the other projects, just this taster will have to suffice! It was nice to get felting again. I've not done any in ages, and I'd forgotten how much I love it. If you are in the UK and haven't tried felting because you have a front loading washing machine, look on my Tutorials page for tips. I've been using a front loading washing machine for felting my projects since 2008, and I've been pretty successful with it. Don't be scared, it's easier than you think! If you want to see more finished objects, then click on the buttons below. I'm sure you will find something pretty to admire!